La Aurora is the oldest cigar manufacturer in the Dominican Republic. Founded in 1903, the company makes cigarettes, beer (such as Presidente), and, naturally, handmade cigars. But the 1495 Series isn’t just a Dominican; La Aurora combined tobacco from four different countries to create this classic-sized five inch by 50 ring gauge robusto. The medium brown Sun Grown Ecuadorian wrapper has a lovely sheen and hardly any veins. Pre-light, the tobacco revealed earthy notes with hints of chocolate. After lighting the stick with some wooden matches, the cigar initially gave off some bitter flavors, but this disappeared after only four or five puffs. After the bitterness faded, notes of earth and nut came in clearly, making for a balanced, medium-bodied smoke. At about the halfway point, some subtle spice added to the complex flavor profile. The draw was easy and the stogie provided abundant aromatic smoke. Another sign of the excellent construction was a perfectly even burn and a gray ash that held for a full inch and a half. 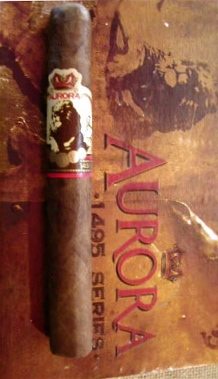 Cigars like the Aurora 1495 show the skill that goes into proper blending. With five different types of tobaccos representing Ecuador, Peru, Nicaragua, and the Dominican Republic (which is the source for the binder as well as one of the filler tobaccos), it is no surprise that the cigar is complex, but what is most impressive is the balance that this complex blend maintains. Overall, with its combination of a flavorful, balanced taste and nearly flawless construction, the La Aurora 1495 Robusto earns the notable rating of four out of five stogies. Never had a La Aurora, maybe I should! I've never even heard of La Aurora. Isn't Aurora, IL where Wayne and Garth were from? I am still trying to figure out what the uproar is about this stick? I found it to be average at best. I purchased about a year ago a box of 7 X 50 Churchill’s and I have about 5 left at this point, I gave away about 8 within the last year. It looks great, burns well but the taste is nothing that sets the world on fire. When it arrived in the rustic paper box, I knew the jig was up! There are hundreds of other cigars that will out shine this stick for a lot less $, and available in bundles at that. I mean 1495 in the above post, but I don't care if it was called a 1400. My feelings would be the same. I just finished one and I agree with you all the way. An excellent smoke, complex and burned beautiful. I would definitely keep some in the humi!! I really like this stogie. It is one of my fav med bodied sticks in the sub $10 range. I like the physical appearance, the burn is great, and the flavor profile is complex. I always want more when I finish one off. Great review as well! The main taste of this cigar with leather, pepper and sweetness but at the same time cedar and earthy notes add to the complexity.